An Escambia County woman was busted red handed Monday morning taking Christmas decorations out of front yards. 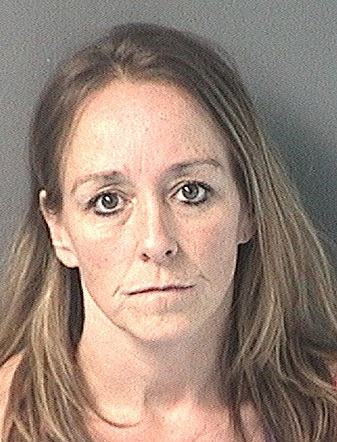 Daphne Ann Whited, age 44 of Cantonment, drove around the Tributary Street neighborhood, taking decorations from yards and placing them inside her vehicle, according to the Escambia County Sheriff’s Office. One resident, Sean Young, caught Whited on camera and posted the photos to his Facebook page. Whited was charged with multiple counts of petit larceny and possession of marijuana. She was released from the Escambia County Jail on a $1,000 bond. Several victims were located and their decorations returned. Whited told deputies that an ad on Craiglist said the decorations were on a lawn free for the taking on Tributary Street. Have her work either Loaves and Fishes or Waterfront Missions Christmas Christmas day dinner. Dang! This woman has three kids. I wonder how she will explain this to them? How pathetic she is! You’re a Foul one, Mrs. Grinch. The sad part about this, besides her tainting Christmas for the victims, is she probably has justified it in her head as OK. She must be really delusional to think people are going to believe she got this off of Craig’s list! I hope her bond does get revoked and she does spend Christmas in jail! She deserves to be with her kind. This lady needs us to pray for her and her family. Pray for her kids! jimmy john has found a way to make this ms grinch story even better with his FSU dig. Looks like the one thing the lady has is great taste in schools. I hope her judge is a Gator. Well, not really, I do hope he’s Seminole. Clasic “BUSTED” photo. Someone buy her some grinch socks! Do feel some what sorry….Woman will NEVER live this escapade down! 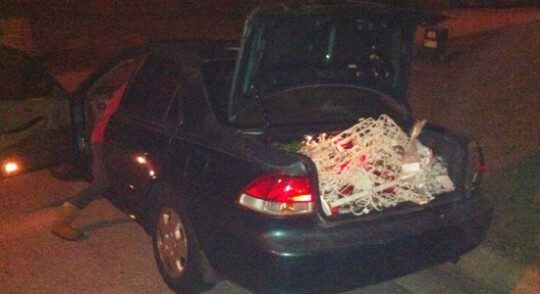 Forever the FSU Christmas Decoration Thief. Judge should make her stand in someones yard wrapped in Christmas lights! Feel sorry for her 3 children!!! They deserve more than this. if she cant afford the decorations how dose she think she can afford to pay her electric bill? by the way the picture is really PRICELESS!! Let everyone know what her face looks like so they can protect themselves. This story is too great!Just the thought of this stupid person getting caught & fined is too funny!Always makes me feel better about myself. I think she should spend Christmas in jail!! There is nothing I hate worse than a thief!! And to steal Christmas decorations is beyond terrible!! I feel sorry for her! She obviously has a drug or alcohol problem. I pray that she gets the help that she needs. Christmas can not be bought ( or in this case stolen). The bible says that all things that are done in darkness will come to light! This is perfect example. I’m sorry that others had to suffer because of this individuals actions. Maybe she can find some kind of peace within herself so that she doesn’t feel the need to steal what other people have worked hard for. I also pray that the people that she stole from will find it in their hearts to forgive her, if they haven’t already. Deer caught in the headlights is NOT so dear! Her family must be Not so proud. Tributary Street is located in the Bellview Community. It runs south off of Bellview Ave, between Mobile Hwy and Community Drive. I’m very glad that people are getting their items back, it’s a shame that hard working individuals have to deal with issues like this. And for those commenting on the FSU shirt, before we jump to conclusions, maybe we should find out if she stole it too LOL maybe she was robbing clothes lines and laundry mats as well as front yard christmas decor! The FSU shirt has nothing to do with the crime she did. Some people just can’t stand it that Mr. Winston chose Florida State over Alabama. She’s lucky the home owner didn’t greet her with a firearm! I have had things stolen from my yard, how can I find out if there are items that have not been claimed? That’s just low. She deserves Christmas dinner in jail. Somebody bring this lady a gift-wrapped brochure to a drug treatment program at the jail. Happy Saturnalia. She should have to spend Christmas in the pokey! There’s not a whole lot lower than doing something like this. 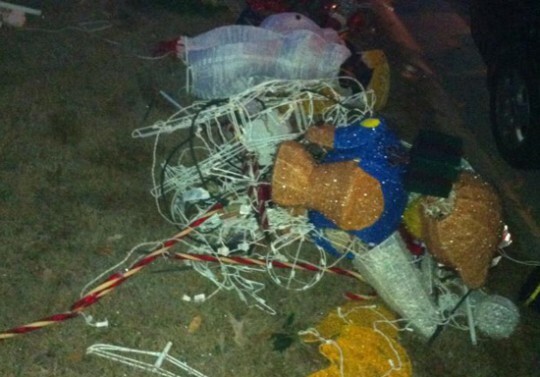 Glad folks got their decorations back but I’m sure it put a taint on their Christmas spirit….I hope not. She is lower than the Grinch Who Stole Christmas. She literally tried to steal it. SHAME ON HER! Good going Mr. Young. Guess whos getting coal in her stocking!!! Baaaa haaaa haaaa. Wonder if she is the one that stole my 3 year olds Elmo decoration from our front yard on Thursday night ? Where is tributary street? Some People don’t care anymore. She was hired by Winston accusers atty to make FSU look bad. Its tough when you are competing with your neighbor to have the most decorated yard. Should have kept her locked up until after Christmas. Man dis is jus wrong…..she goin ruin christmas for kids…. You’re a mean one Mrs. Grinch. Why was she released? Keep her locked up for a few days and let her think about how those she stole from feel. I think she’s lucky he didn’t have more in his hand than a camera! Mr. Young, congratulations on catching this “Grinchette” red-handed. Looks like several homes had their Christmas decorations donated to her cause. Ya gotta wonder, what was the plan for purloined Christmas decorations? This person should look for a stocking of coal. Great that she got caught. There is no excuse for that. Wow. I am glad she was caught and folks were given their property back. Can you say SURPRISE, You are so busted!!!!!! Like to hear her plea of guilty or not guilty to the courts on this one. 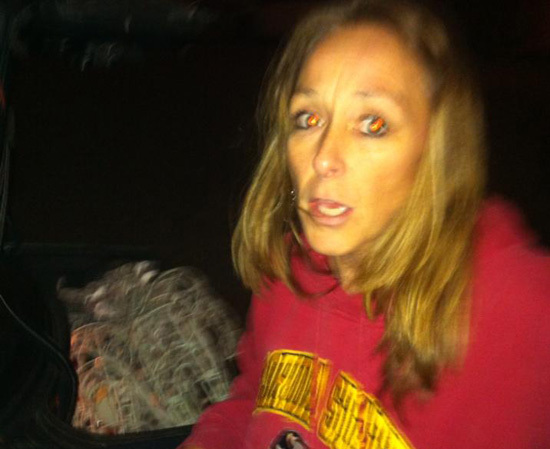 So caught with hand in cookie jar…..the nerve of some people….Busted pics are priceless. Way to go home owner. By the shirt i would say another CrimaNolebusted. And she is wearing a criminoles sweatshirt. Awesome. Way to go Sean Young. Not much I hate worse than a thief.